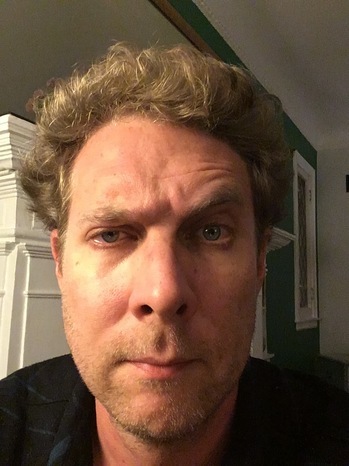 Tom Haley is a writer and pre-amateur freestyle lap swimmer. He has published several essays, and previously worked as a writing instructor, copywriter, and book critic for the Minneapolis Star Tribune, Time Out Chicago, the Believer and others. He currently works for a Chicago software company called Jellyvision, and lives in Albany Park with his wife Julie and his two sons. He is working on a collection of short fiction, and he voted today. Please join Tom and our other amazing readers on Tuesday, November 6, 2018 in the upstairs bar at Hopleaf. Doors open at 7pm, and the show starts at 7:30. It's free, and 21-and-over. Please RSVP on Facebook. Lily Be is a poor brown Be from Humboldt Park Chicago. Lily be has almost died six times in her life, and knows that she is still alive to serve people and communities that could benefit from hearing her stories and brain droppings. She hosts and produces a monthly storytelling show, The Stoop. Her only goal here tonight and any night is hopefully to get ONE of you to want to share your truest and most authentic self with everyone you meet one day. Check her out at Lilybe.com to learn more about all the things she does. 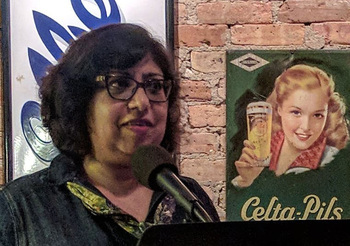 Please join Lily and our other amazing readers on Tuesday, November 6, 2018 in the upstairs bar at Hopleaf. Doors open at 7pm, and the show starts at 7:30. It's free, and 21-and-over. Please RSVP on Facebook. The leaves are changing colors, the air is growing chilly -- there's no doubt, it's fall in Chicago. 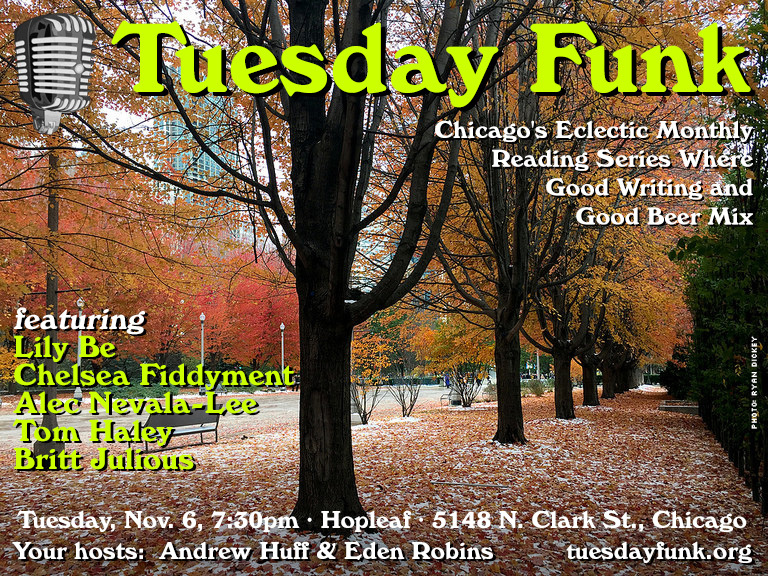 We'll help you get in the spirit with some great live lit at Tuesday Funk! Join us on Tuesday, Nov. 6, when we'll feature readings by Lily Be, Chelsea Fiddyment, Alec Nevala-Lee, Tom Haley and Britt Julious! As always, admission is free, but you must be 21 to attend. Doors open at 7pm sharp (don't dawdle if you want a seat!) and the show will start at 7:30pm. Please RSVP on Facebook -- and don't forget to like and follow our page so you get our announcements right in your stream. Autumn began its blustery descent on Chicago in October, but we were warm and cozy in the upstairs lounge at Hopleaf for Tuesday Funk on Oct. 6. The evening started with a selection of poems by Dipika Mukherjee. Next, Henri Harps shared a portion of a short story about a music teacher and a changing neighborhood in Brooklyn. Then Jenny Hatchadorian read a funny story about a girl dealing with delayed puberty while at camp. We took a break to refill our glasses, and then cohost Andrew Huff read a couple of his topical haiku to get us back in the mood. Hannah Gamble then shared a couple of poems and a short essay, and Angel Simmons closed out the show with a mental walking tour of her Englewood neighborhood. Join us on Tuesday, November 6 for the next edition of Tuesday Funk, featuring Lily Be, Chelsea Fiddyment, Alec Nevala-Lee, Tom Haley and Britt Julious. Hope to see you there! Tuesday Funk #121 is tonight! Ring in October with this stellar lineup: Angel Simmons, Dipika Mukherjee, Hannah Gamble, Henri Harps, and Jenny Hatchadorian! Co-hosts Andrew Huff and Eden Robins will also be there, probably making bad puns. 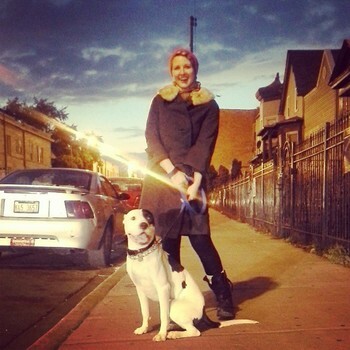 Hannah Gamble is a poet, essayist, editor, performer,and educator. Her first book, Your Invitation to a Modest Breakfast, won the National Poetry Series in 2011. In 2014 she received a Ruth Lilly/Dorothy Sargent Rosenberg fellowship from The Poetry Foundation. 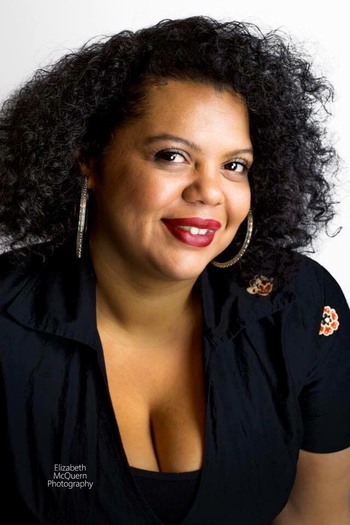 You can find her writing on the Poetry Foundation website, and in magazines such as The Believer, jubilat, Fanzine, and the American Poetry Review. 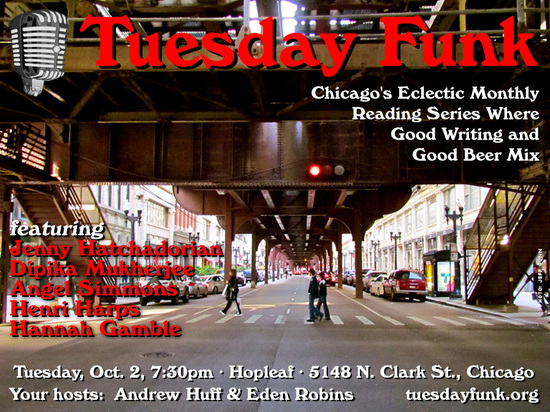 Please join Hannah and our other amazing readers on Tuesday, October 2, 2018 in the upstairs bar at Hopleaf. Doors open at 7pm, and the show starts at 7:30. It's free, and 21-and-over. Please RSVP on Facebook.